Brahe was born on December 14, 1546, in Knudstrup, Denmark (now in southern Sweden), and was raised by a wealthy uncle. In 1560 he witnessed a total eclipse of the Sun; awestruck, he determined to continue astronomical observations. He attended the Universities of Copenhagen and Leipzig to study law, in accordance with his uncle’s wishes, but at night he examined and charted the star­studded sky. In 1563 Brahe observed and recorded an overlapping of Jupiter and Saturn with the aid only of crude compasses and globes. When he investigated existing astronomical almanacs, he found that the measurements compiled by COPERNICUS were inaccurate. With this revelation, he decided to devote himself to correcting faulty astronomical data through careful observation and calculation. Brahe made the groundbreaking observation of a supernova, an exploding star, in the constellation Cassiopeia in 1572. Because the star had been previously invisible to the naked eye, the event caused an uproar among intellectuals who believed in the unchanging nature of the heavens. 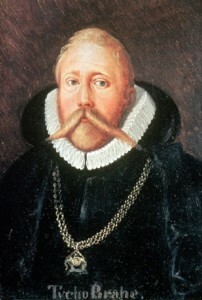 After publishing his finding in 1573, Brahe became a celebrated astronomer. Denmark’s King Frederick II offered Brahe funds for an astronomical observatory to be constructed on the island of Hven (now Ven) in 1576. Until 1597 the artfully adorned and well­equipped Uraniborg observatory served as a major center for astronomical research. Brahe determined the correct positions of more than 700 fixed stars and improved the measurements of planetary positions using a huge quadrant, righting nearly every known astronomical inaccuracy. Without a telescope, he calculated the length of the year from his own measurements with less than a one second error. Yet Brahe never fully accepted Copernicus’s sun­centered solar system, instead proposing that the planets orbit the Sun, which itself orbits a stationary Earth. Funds for Uraniborg began to dwindle following the death of Frederick II in 1588, and in 1597 Brahe moved to Prague. Brahe acquired astronomer JOHANNES KEPLER as an assistant in 1600; he taught him the importance of making multiple observations over long periods to get complete records of planetary cycles. The two worked together until Brahe’s death on October 24, 1601. Brahe’s observations and corrections prodded a framework for the developments in astronomy and physics that took place after the introduction of the telescope in the early seventeenth century. Brahe’s supernova discovery helped dislodge ancient philosophical doctrine. Many intellectuals of the time believed that the future was secured by the harmonious continuity of the whole world and that such harmony was ruled by the perfect and unchanging stars. The foundations of this belief system, established by Aristotle in the fourth century B.C.E., were shaken by the supernova appearing where no star had previously been visible. Brahe’s observations, along with the eventual acceptance of the Sun­centered view of the solar system, caused a revolution in seventeenth­century thought. Brahe’s extensive data contributed to Kepler’s formulation of the laws of planetary motion, which accurately describe the planets’ paths, speeds, and periods (the time it takes to complete a cycle of motion). In 1627 Kepler published the Rudolphine Tables, improved tables of planetary motion resulting from the short collaboration between himself and Brahe. The tables, upon which modern ones are still based, allowed astronomers to calculate planetary positions at any time in the past or future. Kepler’s laws led ISAAC NEWTON to his theory of gravitational force, which governs objects on Earth’s surface as well as the orbits of the moon and planets.